Discovery Park is the City’s largest and most beloved green space with over 600 acres of forests, meadows, and beaches. In the very center of the park at the top of its highest and most scenic hill is a 100 foot tall FAA radar dome which dominates the landscape in all directions and lies within the Fort Lawton Historic District. This District is one of the most iconic places in the Park with wide open spaces and unparalleled views. Surrounding the radar dome is an imposing security fence that defines the current 2.25-acre site (see attached property lines figure). Of that total, the radar dome and it’s maintenance building sit on a square-shaped 1/2 acre of land, with its own dedicated perimeter fence. This footprint size and configuration is virtually identical to the other 46 identical sites scattered around the country (see Minneapolis FAA example). Surrounding this base footprint is another fenced off 1.87 acres that are not being used. We believe that this additional fence line unnecessarily restricts the public from accessing the top of the hill and its beautiful views for no good reason. 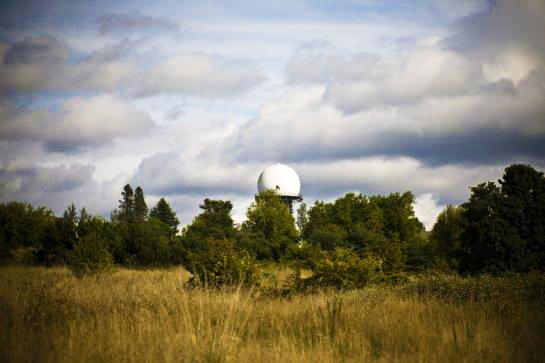 Simply by looking at other sites like Minneapolis, we know that 2.25 acres are not needed for the safe and secure operation of the radar dome. By simply removing the larger external fence, and leaving the smaller 1/2 acre footprint fence in place, security to the tower would be maintained and the public would be able to access this important top of the hill location. Please note that this proposed change would not require any transfer of land or purchases by the City. Ownership of the land would remain with the FAA. They would simply remove the external fence and allow public access to the unneeded and unused 1.87 acres, with the radar dome itself remaining safely and securely fenced. This land is owned by the public, and if it is not being used, the public should be allowed to use it. We feel it’s highest and best use would be for park use and public access. The Friends of Discovery Park has reached out to both the FAA and Senator Patty Murrays office to further discuss this simple and inexpensive change. We have also discussed this issue with the Seattle Park Department. Fort Lawton Air Force Station (1960-1963) – A Cold War Air Force Radar Station first established in 1960 in Seattle, Washington. Relocated from McChord Air Force Base in 1960. Named Fort Lawton Air Force Station after the location. Initially assigned a Permanent ID of RP-1 and later a Sage ID of Z-1. Abandoned by the Air Force in 1963 and turned over to the FAA, now known as Fort Lawton FAA Radar Site.